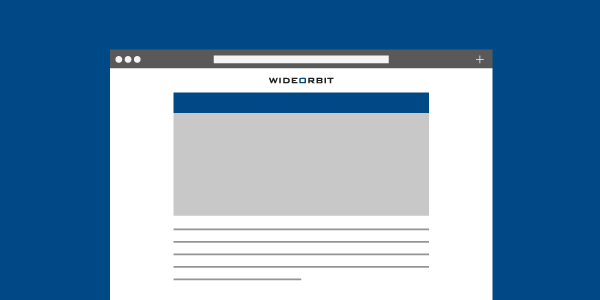 WO Programmatic Radio launched last week for stations running on WideOrbit’s WO Traffic platform. We spoke with Brian Burdick, the leader of our Digital & Programmatic team, who has launched dozens of digital advertising solutions in his career. We wanted to know – why Programmatic Radio and why now? What is “programmatic” and how does it relate to radio advertising? There’s a lot of confusion about programmatic means because vendors use the word in different ways. We keep it simple: programmatic is automated ad buying. Our programmatic marketplace technology automates transactions between stations and ad buyers who want to reach an audience with radio. What are the benefits of adopting programmatic sales? Why would a radio station want to get involved? There are three major things programmatic does for radio broadcasters. Programmatic makes selling easier and more accurate. Programmatic automation makes every transaction faster and less prone to error. In our solution, the programmatic sales channel integrated with our traffic system and the workflow your station already uses every day. Orders and creative arrive inside WO Traffic, ready for your approval. That’s as easy as it gets! Programmatic brings in new advertisers to buy from your station. Programmatic connects stations and networks to brands and agencies that may not have considered buying local radio in the past. Programmatic removes sales objections that stations may never hear. The buyers may not have purchased before because a station was difficult to reach or maybe they simply preferred to buy other forms of media. It’s all about removing frictions from the process. Marketers love programmatic because it improves their ad targeting. Programmatic lets advertisers ‘Bring Their Own Data’ so they can target valuable audiences using their own research and then measure their results. Since many local stations aren’t measured by the major ratings services, digital agencies had a hard time justifying radio to their clients. Now that barrier to doing business is erased. What problems does programmatic solve for broadcasters? Frankly, buying from local radio broadcasters at scale today costs too much for most brands and agencies. Instead, ad dollars go to media that’s easier to buy across regions and demographics, like digital. Why would a buyer make dozens of phone calls to radio stations when they can get all the reach they want from placing a single order on their laptop? Programmatic lets them buy radio just like they do digital. And when a station’s audiences aren’t measured, it’s really difficult to appeal to today’s metrics-driven advertisers. Programmatic solves the data gap by letting buyers use their own analytics to target their messages. They’ll know a valuable audience when they see it. What should stations and networks look for in a programmatic solution? They should look for technology that’s easy to learn and integrates with existing workflows, that leaves them in control of pricing, inventory and and that allows them to consider offers from a programmatic sales channel against all other offers. They should also evaluate the depth and breadth of their vendor’s demand partners. You’ll want to know that your programmatic solution enhances your inventory value by making it easily accessible to the greatest number of interested buyers. What should radio broadcasters do about programmatic today? Start experimenting. Get used to the technology, the workflow and the market dynamics. The programmatic radio market isn’t huge yet, but we know programmatic in digital went from nothing to become more than half of transaction in less than five years. Radio companies should get ready now so they can take full advantage later. Mid-size and large station groups might also want to consider breaking out their digital impressions from their linear inventory. This will help them market their digital audiences’ value to digital buyers with the targeting parameters they’re accustomed to seeing, like device type and geographic and behavioral attributes. If you’re attending NAB’s 2015 Radio Show, be sure to catch Brian’s panel “Unlocking Programmatic’s Potential” on September 30 at 4:00 p.m. in the Atlanta Marriott Marquis Atrium Ballroom.